Honda announced today that it has received Premarket Notification from the U.S. Food and Drug Administration (FDA) for its Walking Assist Device, an externally-worn device developed to support people with reduced walking abilities. This FDA clearance is mandatory for commercial distribution of the device, although Honda has yet to announce any business plans for the Walking Assist Device. The lightweight, robotic device is intended for use on people who can walk, but have gait deficits due to stroke, which is the world's leading cause of adult, long-term disability. Worn orthotically on the user's waist and legs, it facilitates more efficient and symmetrical walking patterns, enabling the patient to walk faster and farther. 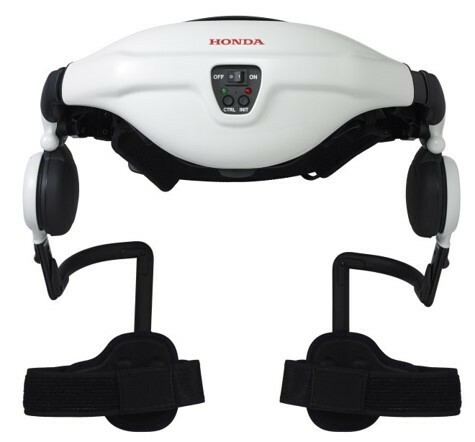 The Honda Walking Assist Device has proven to promote neuromuscular recovery when used by trained healthcare professionals in a clinical environment. "The focus of Honda R&D is to create technology that makes people's lives better, so this FDA clearance is a landmark achievement for Honda's research and development efforts," said Frank Paluch, president of Honda R&D Americas. "This allows Honda to take another step toward reaching the goal of developing products that allow more people to experience the joy of independent mobility." The Honda Walking Assist Device detects hip joint positions during walking with sensors built into the right and left motors, and guides lower limb movements by providing a mild assistive force to the legs. The device tracks left-right symmetry, movable hip angle range, walking speed and other gait parameters, and correlates these characteristics against the measurement history of the user, allowing the data to be analyzed on a personal computer. The Honda Walking Assist Device was tested in a 2014 clinical trial at the Shirley Ryan AbilityLab, formerly the Rehabilitation Institute of Chicago. The findings of the trial, along with continuing research, paved the way for Honda to receive FDA clearance. The clinical trial verified the safety and effectiveness of the device for post-stroke gait rehabilitation, showing that the exoskeleton provided additional benefits over standard therapy practices. "It was evident throughout the trial that the patients using the Honda Walking Assist Device were improving at a more rapid pace," said Dr. Arun Jayaraman, PT, PhD, research scientist at the Shirley Ryan AbilityLab and a wearable technology expert. "The group using the Honda device not only made gains in step length, gait speed and symmetry, but also was able to do more in therapy. This was an added benefit, providing opportunity for greater improvement." In November 2015, Honda began lease sales of the Walking Assist Device to rehabilitation clinics in Japan, and the device is currently being used in approximately 250 facilities throughout Japan. Honda also obtained device certification in Europe (CE Marking) in January of 2018, which is mandatory for distribution and sale of medical devices in European Union countries. Research on the Walking Assist Device began in 1999 and leverages achievements in Honda's cumulative study of human walking, development work that led to the creation of Honda's breakthrough humanoid robot ASIMO. Honda worked with medical facilities and research institutions to gather the most thorough and relevant data, and also spent more than a year developing its application to the FDA, which regulates medical devices such as the Honda Walking Assist Device. Honda established operations in America in 1959 and today employs more than 40,000 associates in the development, manufacturing, and sales of Honda and Acura automobiles, Honda power equipment Honda powersports products, the HondaJet advanced light jet and GE Honda HF120 turbofan engines. Based on its longstanding commitment to "build products close to the customer," Honda operates 19 major manufacturing facilities in North America, working with more than 785 suppliers in the region to produce a diverse range of products for customers locally and globally. In 2017 more than 90 percent of the Honda and Acura automobiles sold in the U.S. were produced in North America, using domestic and globally sourced parts.